Preheat the oven to 200°C, gas mark 6. Place the tomatoes (in a single layer) and onion on a non-stick baking tray. Drizzle over the oil and vinegar, and season. Roast for 20 minutes until the tomatoes are softened but hold their shape. 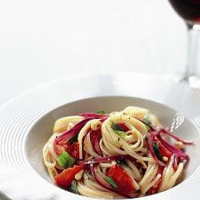 Toss together the cooked pasta, the tomatoes, their juices, the toasted pine kernels, basil leaves and seasoning. Divide between bowls and serve straight away.